How Much Compensation Can I Claim For Loss of Vision or Blindness? 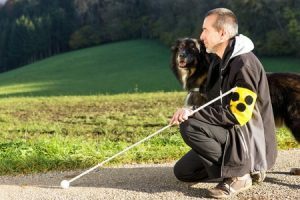 The UK-based charity Action for Blind People reports that about two million people in the UK are living with various forms of vision impairment problems. Among these two million, roughly 360,000 UK residents are registered as blind or partially sighted. According to the Health and Safety Executive, any accident resulting in temporary or permanent loss of vision should be considered a reportable incident. When an individual suffers the loss of eyesight due to the negligence of some entity, that individual may be eligible to claim legal compensation. Additionally, the victim may also be eligible for insurance payout for loss of an eye and other vision-related health concerns. As the loss of partial or full vision is a life-altering event, legal claims related to loss of sight must be reviewed very carefully. This guide will help you understand the compensation process. A guide to loss of sight claims. What is loss of sight? Claiming for loss of sight caused by head injury. Claiming for loss of vision caused by chemical splash. Other common accidents that result in loss of sight claim. Claiming for loss of sight from a accident at work. Claiming for loss of sight caused by medical negligence. Claiming for loss of sight in a public place. Loss of sight facts and statistics. Assessing the severity of loss of sight. The long-term effects of loss of sight. What to do if you have suffered loss of sight? What can be claimed for after an accident leading to loss of sight? No win no fee loss of vision claims. How much can I claim for loss of sight? How to start a loss of sight claim. The loss of eyesight – whether partial or full – can be devastating. Loss of sight forces a person to adapt to new habits and to a new lifestyle, wherein they are forced to give up freedoms and potentially prepare for life-long dependence on external support and care. The sudden loss of income, loss of daily habits, loss of social interactions, public embarrassment, and more can become unbearable for the victim. This guide prepares the victim and the close family members for the complex legal process of filing for compensation following an accident which has caused partial or full loss of sight. The guide discusses what qualifies as blindness, the common causes of loss of sight, the claims process associated with each type of blindness, and the legal help available for UK citizens. If you would like further information regarding your loss of sight claim, the contact information provided at the bottom of the page can be used to contact us at any time. Loss of sight refers to the various ways in which a person can lose functionality in one of their senses, specifically their vision. This loss can happen for a multitude of reasons, including medical conditions, accidents, and the general ageing process. In terms of accidental loss of sight, injuries which have been sustained as the result of accidents and have led to a loss of sight or another form of vision impairment can often be suitable for a compensation claim. If you have lost your sight to some degree following an accident, you may be owed compensation. A blow to the eye during a physical fight. A chemical splash while working in a factory or chemical plant. Dirt or grit lodging itself in the eye. Dangerously bright light while working with cameras, outdoor shoots, or in recreation halls. A head injury caused by road traffic accidents or a slip, trip, or fall. Sharp object penetrating the eye. Medical negligence causing partial or full blindness. Whatever the circumstances surrounding your loss of sight, you may be owed compensation. You can contact our team today for more information. Many types of head injuries – such as those caused by a traffic accident, a fall, or a hard blow on the head or face – can lead to partial or total blindness, depending on the severity of the impact. In any of these cases, you may have a legal right to raise a claim for compensation against the persons or entities that caused this damage to you. You should approach an experienced law firm such as ours in order to understand the legal process for filing a claim. If you work in a chemical factory or plant, regular exposure to chemical splashes makes you vulnerable to loss of eyesight, due to the physical contact between harsh chemicals and your eyes. This risk can potentially increase if you have not been provided proper safety gear in order to carry out your daily responsibilities. As we will see in a later section, employers are bound by law to provide protection for workers using chemicals which may harm them. Likewise, the occupier of a public place will have a duty of care to protect members of the public from suffering from chemical-related issues. If you find that a chemical splash has led to a loss of sight injury, you may be owed compensation. If you suffer the partial or full loss of eyesight, we are here to help you and your fight for loss of sight compensation. In the above situations – as well as many others – if you have the ability to prove that another party acted in a negligent manner you may be owed compensation. Seeking out the assistance of a legal team can help you in this matter. Safe handling of hazardous materials, including chemicals. Providing proper work gear for employees. For example, safety goggles for protecting the eyes. Safe operation of machinery to prevent accidents. Requisite training in how to best protect oneself against injury. If the employers are found to be guilty of violating safety norms and standards in a workplace injury case, they may become liable for any accident which causes injury or damage to the employee. In order to claim compensation for loss of eye at work or in other contexts, a legal adviser might take into account a number of factors, such as who is responsible for the eyesight injury; who is liable; what laws may be applicable in a particular case; what is the extent of the damage; how much compensation can be claimed; and many other factors. So, if you suffer loss of eyesight at your workplace, you should seek out the assistance of informed professionals. In cases where a wrong diagnosis, poorly-performed eye surgery, or incorrect follow-up treatment causes partial or total blindness, the patient has a legal right to file a case against the healthcare providers, including the hospital, doctors, nurses, and pharmacist who may be jointly responsible for such a loss. Loss of eyesight due to medical negligence is a very serious charge and many cases will need to be taken to court. If you have suffered the loss of eyesight due to medical negligence, dedicated legal advice may be necessary. We have the legal experience required to deal with both a blindness in one eye claim or total blindness compensation claims. Owners of public facilities such as cinema halls, shopping centres, parks, or libraries have a legal obligation to provide a safe environment for the employees and visitors. Even civic facilities like roads, pavements, bridges, and bike trails are included in this category. The Occupiers Liability Act 1984 provides protection for any and all visitors to a public place, including those who are unauthorised. Thus, if an accident occurs which results in a loss of sight and the occupier of a property can be found to be in breach of this act, they may be liable for a compensation claim.If your injury occurred in a public place as the result of negligence or a similar breach in an occupier’s duty of care, you should contact a law firm for representation. Today, about two million UK residents are partially or totally blind. This trend is on the rise and, by 2020, 2.3 million people in the UK will have vision problems. In the UK, one out of every nine persons aged 60 and above is living with sight loss. In the UK, about 25,000 children in the age group of 0 to 16 are partially or totally blind. Among this population, about 50% have other disabilities and special learning needs. The total expenditure on healthcare linked to eye health in the UK is £2.64 billion. Total NHS expenditure on eye problems in the UK is £2,255 million. As evidenced by the above statistics, loss of sight is both a common and an expensive issue in the UK. If you believe you are one of the millions of people affected – and you believe that it was not your fault – contact our team today for further advice. citizens by the UK Government and social services departments. In this procedure, the specialist measures certain attributes of the patient’s eyesight (such as distance vision) to make this assessment. Based on the results of the eye tests – if the patient qualifies for a certification – the patient may be provided with an official certificate for many government benefits. This special certificate is known as a Certificate of Vision Impairment (CVI) in England. With this certificate, it becomes easier for the visually impaired individual to become eligible for government benefits. In legal claims cases involving loss of sight, the solicitors can ask for and use a vision impairment certificate to strengthen the case against the guilty parties. For example, determining compensation for loss of sight in one eye disability can depend on the severity of the injury, a fact which can be proved using the certificate. Also, the particular circumstances of an accident or negligence case may have a bearing on the potential success of a claims case. Having to leave current employment or seek new employment, depending on your abilities to fulfil your previous role with lowered visual abilities. Having to re-purpose your home in order to navigate the rooms following a loss of sight. Having to learn braille, purchase specialist equipment (such as a visual impairment–optimised telephone), and possibly even learning to work with a guide dog. The loss of reputation or social status one might feel following the loss of their sight. Mental health conditions stemming from the injury. The long-term effects of such an injury will likely form a large part of any compensation claim. If you would like to learn more about the long-term effects and how they may impact your life, you should contact our team. Seek another medical opinion. We can arrange for an eye specialist for an impartial view of the situation. This will be mandatory for a loss of sight due to medical negligence case. Collect and organise any documents or evidence that may be used for building a strong claims case. If eyewitnesses were present at the site of your accident, talk to them and make detailed notes. Start collecting all the bills and receipts following the accident and make a rough estimate of all the financial losses, including medical expenses, loss of income, and pain due to psychological trauma. If you are unable to carry out these steps by yourself, ask a reliable person to complete these steps on your behalf. By following the above steps, you can position your claim in the best possible way before you proceed. With these steps completed, you are in the perfect position to seek professional assistance. General damages, which may include compensation for pain, compensation for medical staff negligence, compensation for employer negligence, or compensation for any other third-party negligence that caused the loss of sight. Special damages may include damages to property which occurred in the accident and other costs which are easily quantifiable. Medical expenses may include all medical expenses beginning with the loss of sight incident, including all general and special medical expenses. Travel expenses may include all transportation costs for travelling between the accident site and the victim’s home, between the law office and the victim’s home, and all other trips related to the loss of sight case. Rather than providing an average settlement for loss of an eye, each case should be considered on its own merits. As we will see in a later section, this can be difficult to predict. Following an accident – especially one which has caused a serious injury – you may be struggling. As well as simply not knowing what you should do next, the financial implications of an accident can be worrisome. This is especially true in loss of sight accidents where you may be prevented from working. Thankfully, our company is able to offer an easier way to seek compensation. Our Conditional Fee Agreement (CFA) – also known as our ‘No Win No Fee’ agreement – means that you pay nothing until the case is won and you are compensated for your injuries. This ‘No Win No Fee’ approach protects you from unnecessary expenses and protects you from mounting costs during lengthy legal cases. If you win and receive compensation, we simply take our fees from the final payout. Many clients find this approach much easier and far less stressful. Our personal Injury solicitors are used to dealing with a wide variety of accident and medical negligence claims related to full or partial blindness. Generally, the severity and extent of the damages determine the amount of compensation you receive. In some cases, the circumstances of the accident may also have a bearing on the claims case. If you like to find out how much compensation for loss of sight in one eye you might receive, it is difficult to provide an accurate estimate. As individual cases are evaluated on their own merits, the following pay table simply provides some representative injuries with associated severity levels and average payouts. Brain or Head Injury Very Serious (i) In the region of £307,000 Complete loss of vision and hearing. Eye Injury Very Serious (ii) In the region of £204,250 Completely blind in both eyes. Eye Injury Serious (i) £73,000 to £136,700 Loss of vision in one eye. Second eye may also go blind. Eye Injury Serious (ii) £48,600 to £80,500 Incomplete vision in one eye. The vision starts to deteriorate. Eye Injury Minor (i) £6,925 to £15,950 Slight impairment of eye. Can recover. Eye Injury Minor (ii) £3,000 to £6,650 Slight impairment of eye. Can recover. Eye Injury Transient £1,675 to £3,000 Complete recovery of sight. Though this table should not be used as a definitive estimate of your compensation total, it can provide insight into the way in which the severity of an injury and the circumstances of an accident can affect your claim. If you would like a more nuanced estimate, take advantage of our free legal consultation today. Following an injury, knowing where to begin with a complicated compensation claim might prove to be tough. There are plenty of laws, regulations, and statutes which should be considered and can affect the case in a big way. This is why we advise our clients as to the benefits of working with legal professionals. For example, our firm is able to offer a free legal consultation with no obligation. When you want to know how to start a case, this can be the perfect place to start. If you decide to take advantage of our session, we can review your case in greater depth. We can examine the evidence you have and listen to your story. In doing so, we can provide an informed and experienced opinion as to whether you have a case and advise you on what to do next. If you decide to work with us, we can even offer you a ‘No Win No Fee’ agreement at this stage, lowering your financial risk. If you decide to proceed, we can help with the gathering of legal evidence, we can research the case, we can file the legal documents, and we can set the entire process in motion. We can even arrange for you to visit a local specialist and be sure that your health is properly evaluated before the case. When you want to begin a claim, this can make the entire process much, much simpler. Expertise in varied types of personal injury and medical negligence laws. Legal consultation and legal representation from start to finish. Conditional Fee Agreement; you pay only if you get compensated. A free, no obligation consultation session with our experts. You do not have to search around for the best law firm. You have come to the right place. So why wait? Call our offices now and find out how much we can do to help you. If you believe that you are owed compensation, all you need to do is call us at 0800 073 8804 for a free consultation. Alternatively, you can arrange a session using the contact form on our website or even use the web chat feature online. We’re ready to hear about your case and we’re ready to help. This NHS link provides very useful information on loss of vision and blindness. Accident At Work Claims – Find out How Much Compensation. Find out how much compensation you can claim for an accident at work and also see if you can claim for loss of earnings contact us today for free legal advice.